Farming families from Germany and New York state were among the first settlers to trudge along the Native American trail-now Ogden Avenue-and build their homes on the fertile prairie land that became Western Springs, Illinois. The village, which was incorporated in 1886, was named for the mineral springs located near the local train depot. Through the medium of historic photographs, this book captures the evolution of Western Springs from the mid-1800s to the present day. Today, the village's limestone and brick water tower, built in 1892, still stands as the centerpiece for many village events and celebrations. 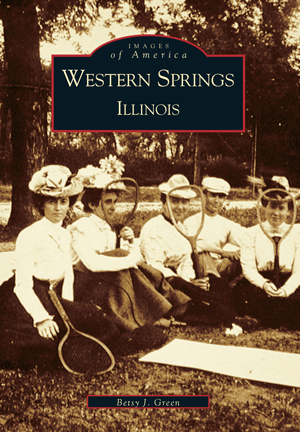 With nearly 200 vintage photos documenting the village's first century, including the first schools and churches, old-fashioned automobiles, and a photo of a young local woman who was one of only 305 female marines in World War I, this book brings to life the evolution of Western Springs from farming village to stately suburb. Betsy J. Green, a professional author, historian, and former vice president of the Western Springs Historical Society has also included, in the book's final chapter, a portrayal of the village in 2001. She hopes it will serve as a historical document in the decades to come when people try to remember life in Western Springs at the dawn of the new millennium.